James Sherwood has become one of the country’s foremost comedy writers and continues to rapidy ascend the stand-up circuit. 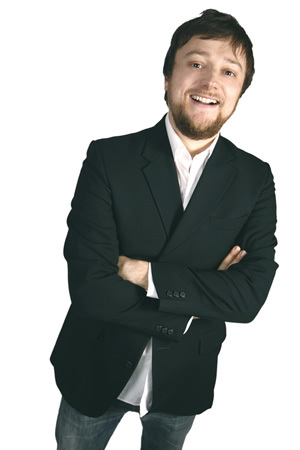 Having received the BBC Radio Entertainment writers’ bursary in 2008, James contributes the funnies to radio shows across the BBC, including The Now Show, The News Quiz and BBC7’s new topical comedy sketch show, Tilt. As well as that, he regularly reviews the newspapers on Sky News, writes a regular blog on the Guardian website and spends most Sundays singing in a church choir, despite not actually being religious. His debut Edinburgh show in 2006, ‘I Know What You Did Last Sunday’, was a total sell-out and was followed in similar fashion with 2007’s offering, ‘James Sherwood’s Somewhat Premature Review Of 2007’. He plans to take his third show, ‘Songs Of Music’, to the Fringe this summer. Having originally made a name for himself on the live circuit as a topical comic, in recent years James has incorporated a number of self-penned, original comic songs into his act. Although this involves lugging a keyboard around with him, it’s worth it – songs about grammatical inaccuracies and failed nightclub courtships have had audiences literally crying with laughter.